Ryukyus, 1948, 1st Issue, 1st printing, 5s-1y complete, complete matched set of bottom margin imprint pairs, o.g., never hinged, strong vivid colors, all bright and fresh, Very Fine and choice, a lovely position set. J.S.C.A. No. 1-7. JSDA No. 1-7. Scott No. 1a-7a $930 for singles. 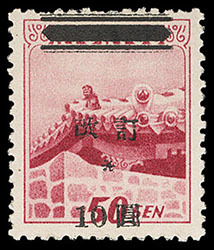 Ryukyus, 1950, 2nd Issue, 50s rose, imperf trial color proof, without gum as issued, wide margins, small black printing anomaly, Very Fine, quite rare. 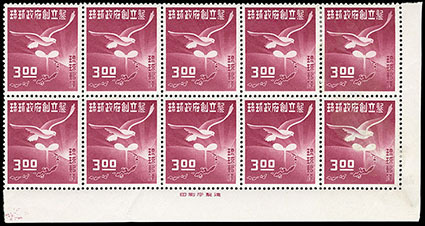 Ryukyus, 1950, 3y Opening of Ryukyu University, imperf proof, left margin single, without gum as issued, wide margins, Very Fine and choice, a splendid example, from sheet of 50 of which at least 11 were damaged, ex-Kamiyama; with 1992 R.P.S.S. certificate. 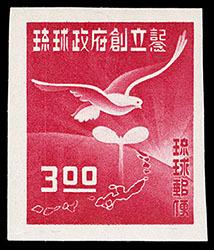 Ryukyus, 1950, 3y Reforestation Week, imperf proof, position 21, left margin single, without gum as issued, Extremely Fine, a splendid example, from sheet of eighty of which at least 15 were damaged, ex-Kamiyama; with 1992 R.P.S.S. certificate. 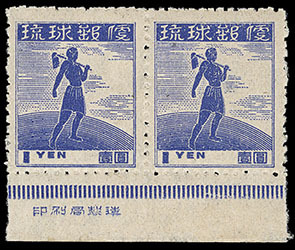 Ryukyus, 1952, "Kai Tei" (revalued) surcharge, type II (2nd printing), 10y on 50s dark carmine rose, surcharge transposed, showing a 6mm downward shift in surcharge, o.g., never hinged, Very Fine, with only 85 examples known. J.S.C.A. No. 16B var. JSDA No. 14b var. 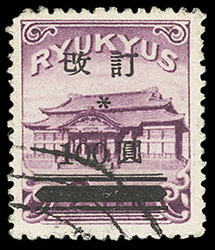 Ryukyus, 1952, "Kai Tei" (revalued) surcharge on Shuri Castle, 100y on 2y rose violet, neat corner cancel, rich color, blunt corner perf at upper left, otherwise Very Fine, far rarer in used condition despite the given catalog values, ex-Kamiyama. J.S.C.A. No. 17. 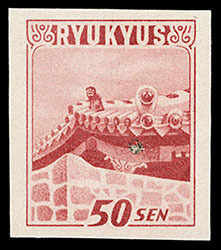 Ryukyus, 1952, "Kai Tei" (revalued) surcharge on Shuri Castle, 100y on 2y rose violet, "Kai Tei" in 8/8 point type, o.g., lightly hinged, choice margins and centering, bright vibrant color, Very Fine and choice, ex-Kamiyama. 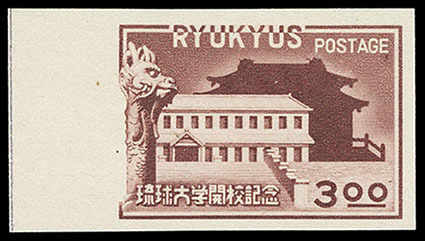 Ryukyus, 1952, Establishment of the Government of the Ryukyu Islands, 3y scarlet, trial color plate proof, o.g., never hinged, ample to large margins, Very Fine, quite rare. 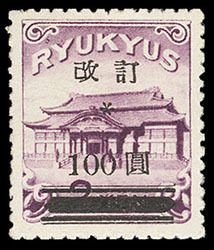 Ryukyus, 1952, 3y Establishment of the Government of the Ryukyu Islands, corner margin inscription block of 10, o.g., most never hinged, some thinning affecting right stamps, Very Fine appearance, still a rare imprint block. J.S.C.A. No. 18. JSDA No. 3. 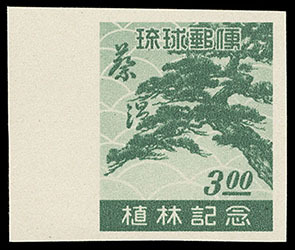 Ryukyus, 1958, Sonohyanutaki, 30y light olive green, 2nd printing on white paper, corner margin inscription block of 10, o.g., never hinged, bright and Post Office fresh, Very Fine, very rare and undercataloged, with less than seven blocks are believed to exist.